I've nearly stopped watching movies because it's all become dramatically politically correct, there must be a black man or woman who is a doctor or scientists, there must be a lesbian or there must be a gay guy, the white guy is either crazy, racist, stupid or bad (or all four) and the white woman is helpless and is saved by the genius doctor or scientist (or both), the crazy white guy ends up dying even though he wasn't actually crazy, nor racist, nor stupid, nor even that bad. "Bird Box" with Sandra Bullock on Netflix has been getting a bit of attention and when my friend asked me if I saw it, I simply asked if any of the criteria in my above paragraph was met and with the a laugh the friend said yes. "No thanks, i'll pass" was my response, "movies are simply lacking in original content that isn't marred by political agendas that take the viewer out of the movie." No wonder nobody cares about the Oscars anymore. My gripping about how terrible movies are still doesn't stop me from reading about the movies to see how accurate my predictions are, so without further gilding the lily and with no more ado, I give you some of the reviews from imdb. What movie are you people watching? 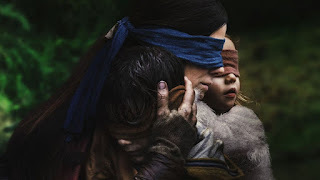 Bird Box Bird Box is a suspense-drama with a touch of supernatural horror, however, the format is simple and full of the usual clichés. In this case a group of individuals are holding out in a house trying to ride out an invisible evil threat that is making people all over the world, violently kill themselves for no apparent reason. The movie is shot in flashback format where the main character, Molly, played by Sandra Bullock, is on the final leg of a trip where she is attempting to escape with two children. She is taking them by row boat down a river. During this trip she reflects on the sequence of events which got her to this point. There is nothing new about this movie, as it embraces the usual clichés of searching for provisions, dealing with conflicts within the group, and watching fellow group members die, sometimes in a somewhat slapstick horror comedic sort of way. We've seen this so many times it's almost insulting to point it out. I bring it up because I consider this to be the first fatal flaw of the movie, lack of originality. Matters only get worse as the movie is packed with the usual stereotypical supporting characters such as the gay guy, the obnoxious white guy, and the comedic chubby black guy. Also, there is the low esteem overweight and pregnant young white women, the old lady, and the black male protector who carries out his duties faithfully, but who also has an intimacy agenda as it relates to Bullock. These characters are what I would call disposable stereotyped characters because they're all temporary props, easily replaced vessels which carry the movie along to each subsequent bland cinematic destination. We know that for them, the future is as bleak as their lines and that each one will die at the prescribed time. This type of casting is insulting and easily reveals the shallowness of the script. These 2 additional fatal flaws ensure an anti-climactic end, because we have known since the opening of the film, that Bullock will live, and all we're doing at this point is watching to see how everyone else dies and if the ending gives us a sigh of relief knowing that we didn't waste our time watching it. The movie was OK. Definitely better than the Happening, and that's not saying much, but the Bird Box certainly did not live up to the hype. In a post-apocalyptic world where a supernatural entity is making people kill themselves once they see "it", Sandra Bullock's character must make it through the forest to a safe haven with two young children in tow, all while blindfolded - so she won't see "it". That's the premise and it's not too plausible. Walking through a dense forest blindfolded? Yeah, right. Hell, some people wouldn't be able to halfway walk through the woods without tripping over a log with full sight, yet we're expected to believe she can navigate blindfolded just fine with two children in tow? Anyway, we do get to see how Bullock's character got to this point via flashbacks, and quite frankly, those are the better parts of this movie. 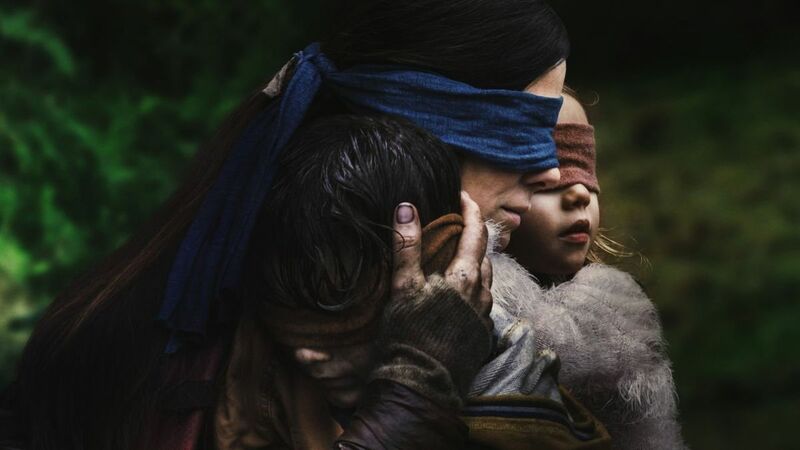 I think the best scene in Bird Box was when the initial survivors at the house in the city ran out of food and had to make a trip to the grocery store. Without giving away any details, this sequence is one of the few bright spots in terms of originality that you will see in this film. Besides that, we just see survivors surviving and then getting killed off and not much else. If you're looking for: who, what, why, or how? Good luck, you won't find "it" here. Otherwise, decent cinematography and acting by Sandra Bullock, John Malkovich, Trevante Rhodes, and the little girl are the only things holding this movie together. It's worth a look. 5 stars. A 15 minute short film agonizingly stretched into full length. There are some fantastic short films out there that most mainstream viewers are never exposed to. That is what this should have been. Instead, we are treated to a 15-minute story of content, stretched with filler of melodrama, useless over the top characters, and Sandra Bullock's very tired overacting like she's rehearsing in the shower. This would have made a great short; instead it is bloated and just plain annoying. Oh... and the end of the film - without spoiling it - there's not much to spoil. No answers are forthcoming, only that there's a temporary at best escape. It's called being in a small holed up community that's destined to eventually collapse. Not much of a happy ending. We don't find out a damned thing about anything. I just could not buy the idea that people could drive a car with totally blacked out windows in a debris filled town. Or that someone could row a boat blindfolded in a rough river. Ot wander through a dense forest blindfolded, leading two tint children, also blindfolded. Just too ridiculous. And the ending was extremey weak. Another bomb by Netflix. These babies are adding up. This movie is putrid. The entire film is made up of "there's no way that could happen" moments. Besides Sandra B, who wasted good talents on this nonsense, acting is terrible. Add in that cast is run of the mill force fed political correctness. The survivors are made up a gay Asian, an Indian, Hispanic, couple of black dudes, fat white chick, mean white guy and Sandra B. 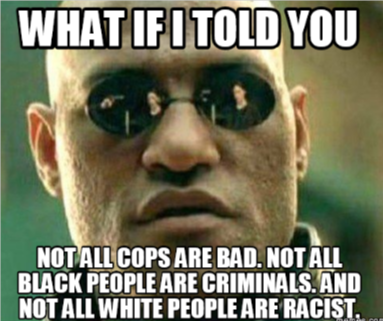 The dozen or so bad guys are all white dudes. Typical Saturday night network tv casting. 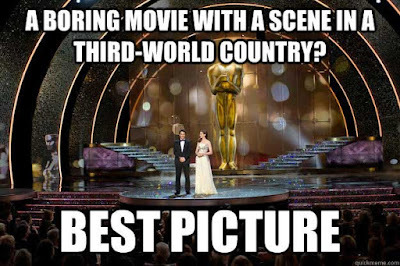 Regardless, the movie would have been pathetically bad even with different casting. If this were the first film of it's kind, it would still be unoriginal. The unseen monster is not a new idea in story telling, nor is having no ultimate meaning or purposeful intent. There are no spoilers here, that's the conceit. We can retitle this "Don't look Mrs. Lot". 1. cinematography is adequate, like the work of a cameraman who has made films for television with limited resources. The multitudes of closeups and quick edits obscure the lack of uninteresting scenes, a trick borrowed from low budget television. I think the TV series "Lost" had better photography. 2. The sound is actually high fidelity. That said, it plays with the same intensity as it did in the last ten thousand horror films. It acts as a cover for dead scenes and pablum dialogue. In short, unoriginal. 3. The acting, which has been hailed as fantastic, is true hack work. 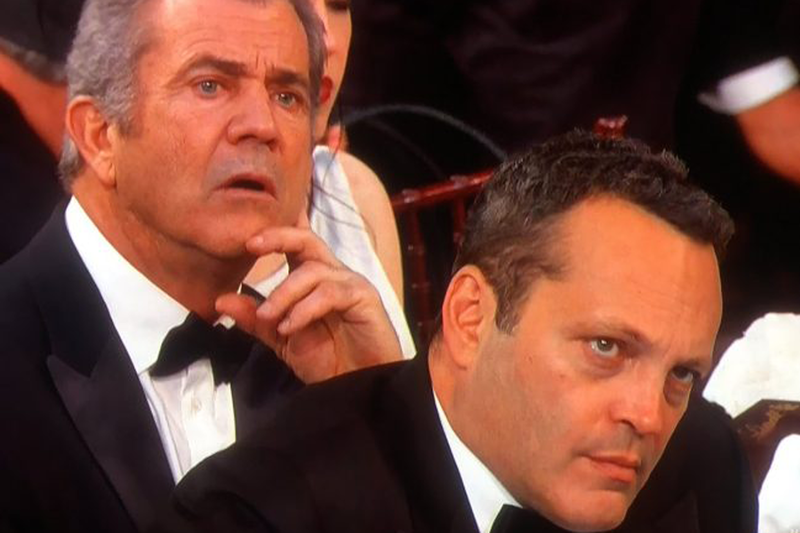 Bullock and Malkovich could have phoned it in. Hack: "A cheap, mediocre, or second-rate practitioner, especially in the fields of literature and the arts". I would have preferred unknowns with potential, than reprisals of every character these two have played before. It must have taken them minutes to prepare for their roles. 4. The worst part is the story, dialogue and screenplay. Josh Malerman's book wasn't even that good to start with. The "Bird Box" was a first novel by a rock musician. Go figure. As I've said, the premise is unoriginal, the characters are thinly drawn, and the dialogue is just lubrication for a rusty script. "Hold on, hold on,. . . hold on . . . jump please . . . jump . . . over here girls, " You get the picture. Overall, the comparisons to M. Night Shyamalan's "The Happening" are apt. It's equally drawn out and unsatisfying in the end. There is no there there. . . Comparisons to "The Quiet Place" are unfair. The "Quiet Place" was far more engaging, had solid cinematography and a very original soundtrack to instill fear. Though that film wasn't too deep either, it's portrayal of family bonds and the fall of humanity were at least touching. In contrast, here we root for many of the annoying characters to die. Lastly, there are alot of shill reviews about this movie. Shill: "an accomplice of a hawker, who acts as an enthusiastic customer to entice or encourage others". The glowing reviews appear canned and absurd, even if they enjoyed it as film fodder, their one paragraph enthusiasm is clearly insincere. I encourage you to be harsh in your ratings to counteract this ploy to raise this films overall score. In the end, this horror film is a simulacrum: "an unsatisfactory imitation or substitute". Example: The "Bird Box" is a bland simulacrum of an original horror story. This might has well be likened to a modern ghost story, with an unseen entity from beyond, not knowing where it came from or what it wants. Meh . .
Is a government debt an allegory here? Is it possible for anyone blind grow food in a backyard for several years? I can accept the "creatures', because they are fictional, but growing food and running in a forest wearing blindfold is something that we know can't be done unless some other, good, creatures are helping you. To the end of the movie, I was waiting for some kind of clarity about the creatures and bad insane guys or at least to see some kind of meaning of the whole story, but I was left clueless. To me, the movie is just stupid in general and in many details. If the thing called "creatures" is a government debt, then the movie makes perfect sense. Think about it: The debt is so horrifying that when you open your eyes and see what it will bring, you want to commit suicide. Only bad guys are untouched by the debt, because they are actually capitalizing on the destruction. I can live with this allegory. Which is more proof that these review websites are intentionally skewed by Hollywood studios (in this case Netflix) it's no coincidence that Netflix got rid of their star review option because nobody would ever watch their website. Yes, I cherry picked the above reviews, however, if you take a look, the overwhelming reviews are 5 stars and less with a few fake 8/10 responses no more than a paragraph long.